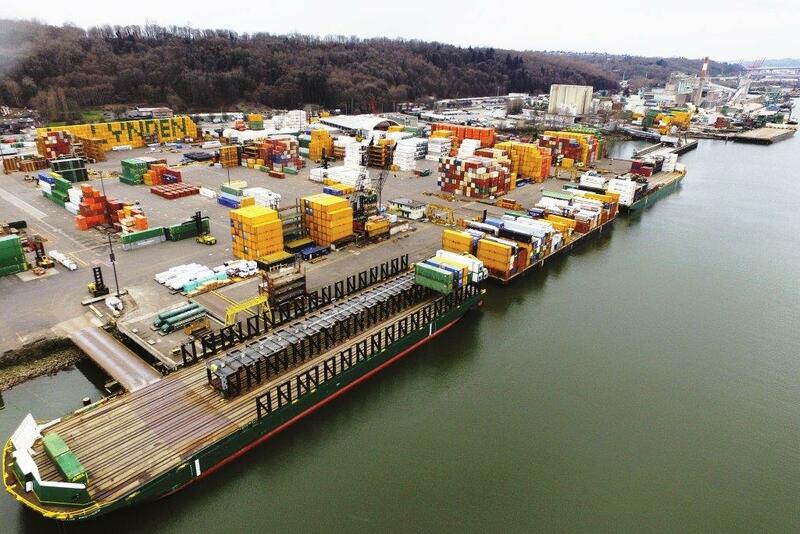 Alaska Marine Lines/ Terminal 115 (Y-5) has gone above and beyond to prevent pollution and keep sediment, trace metals and accidental spills out of Seattle’s Duwamish River. Silt and trace metals such as copper and zinc occasionally come into Alaska Marine Lines facilities from dust and dirt in the wind or on trucks and shipping containers, and in rainwater. Truck and forklift tires are the primary contributors of zinc. The Storm Water Pollution Prevention Plan (SWPPP) and filtration equipment keeps these sediments, metals and other contaminants out of the storm drains and river when it rains. “The first line of defense is good training,” says Training Manager Jerome Chen. “Our people are trained to respond immediately to all spills and our two sweepers clean up about 25 tons of dirt per month.” Filter baskets in 264 storm drain catch basins at AML locations remove silt and form a barrier to catch fluids from accidental spills. Every catch basin is tied into a Clear Water treatment system. Since 2014, the treatment systems have processed and discharged millions of gallons of clean water. The tanks were constructed out of containers and flat-racks. In addition to the Clear Water system, three new storm water Rx units were recently installed to capture extra runoff at Y-5 and incorporate runoff from Y-3 and Y-4. The passive filtration system targets a variety of pollutants and discharges clean, treated storm water into the Duwamish River. During an exceptionally large rainstorm, nearly 200,000 gallons of water was successfully treated in one day at Terminal 115 (Y-5). “Alaska Marine Lines locations at Y1 and Y2 have been using these Rx systems since 2011 and have consistently achieved testing benchmarks. We anticipate similar results for the other locations with our newly installed systems,” explains Andrew Heuscher, Director of Safety. Last winter, the salt bagging operation moved from Y1 to Y5 and a new covered salt storage and bagging operation was installed. The move has eliminated excessive moisture in the bagged salt and reduced salt leaching into the filtration units. Lines running between catch basins at Y-4 and Y-5 were cleaned of years of metal-laden silt and silt. Efforts continue with lines in Yards 1, 2, and 3. A 70-inch, 1,300-pound propeller from Bering Marine Corporation’s Arctic Bear tugboat now graces Seattle’s North Passage Point Park as a sculpture honoring the Seattle-Alaska maritime industry. The prop was one of a pair on the shallow-draft tug that was in service in Prudhoe Bay. 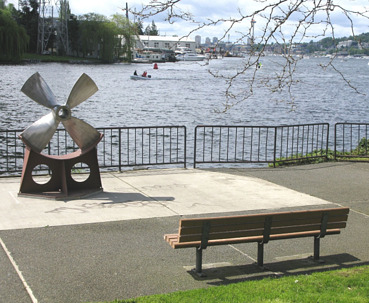 It’s been a long journey from the day Bering Marine gifted the stainless steel prop to Naval Architect Philip Thiel and its installation at the park this spring. 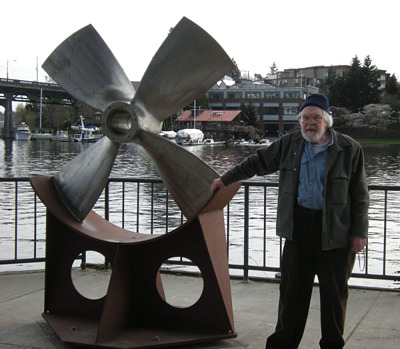 Philip, a University of Washington Professor Emeritus of Architecture, Urban Design and Planning, designed the base for the propeller and he planned to donate the prop to the parks department for use in the maritime sculpture. Shortly after the prop was delivered to Philip’s home in Seattle, thieves pulled up in a truck and stole it right out of the back yard. A Seattle TV station aired a story about the crime and the Seattle Parks Department issued a press release asking for the public’s help to find the missing prop. “Philip filed a police report, but we didn’t hold out much hope,” says Linda Hubert, Maintenance Manager for Seattle Parks and Recreation. “They were obviously thieves with some mechanical resources to nab a huge, heavy propeller inside a retaining wall and fence. Phil was broken-hearted.” He offered a $1,000 reward to anyone with information about the crime. Police speculated that the thieves wanted the stainless steel propeller for its scrap metal value. After the word got out, a security guard at an industrial park in Kent, WA discovered the stolen propeller and contacted the Kent Police Department. The propeller was transported back to the site and the sculpture was completed. The monument (above) includes a plaque identifying the Arctic Bear propeller and Bering Marine Corporation’s donation. 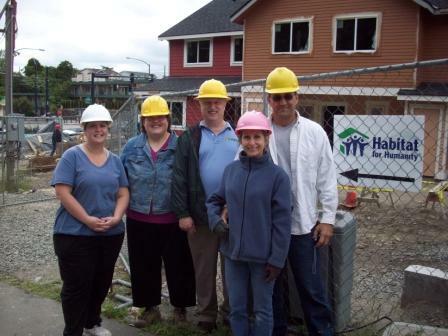 Photo: From left to right are Laura Foster, Elisabeth Wittenberg, Mike Woodham, Jeanne and Clark Miller.